TV, radio, internet and large billboard ads costs thousands of dollars each year, run for limited time, and often leave FI’s searching for more cost- effective and targeted tool to increase brand awareness. In comes the branded ATM….. Lets face the facts. There are traditional “free” marketing tools out there. “Free” marketing tools like email, in-branch advertising and online banking ads can provide cost effective marketing opportunities however they are often time consuming. They are also very unlikely to actually increase brand awareness and attract new customers or members. ATM branding offers solutions to many of the problems marketers face. 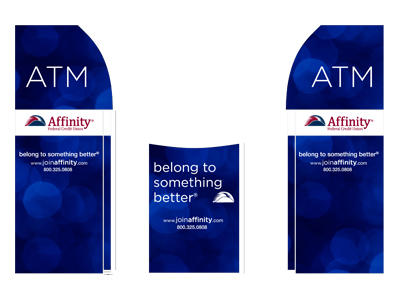 Typical branding solutions feature custom wraps, ATM Toppers, and customizable screens usually costing around $400 and designed to last up to five years. Many independent ATM companies even offer branding packages for high profile off-premise locations such as pharmacies, gas stations, convenience stores, grocery stores and other name brand retailers. Branding existing FI ATMs is easy and inexpensive, adding on average a mere $80 per year costs to running the ATM (cost of the wrap over a 5 year period). Retail branding options offer full ATM management as well as branding for a low monthly fee, usually much lower than the cost of branding and running an ATM individually. In fact, ATM advertising is 65% less expensive and 200% more effective than direct mail, according to NCR, Inc. Branded ATMs are not only inexpensive to run, they also directly target the consumers within the FI’s community or region. For example, we have branded ATMs in office buildings, in hotel lobby’s, in housing developments, in club houses, sports arenas, and they are all designed to attract users and expose new customers to the FI’s brand. Just think, where do your customers or members go, work, shop or hang out. Studies show that consumer trust an FI branded ATM over a non-branded ATM, even when its not their own FI. This phenomenon typically leads to increased transaction rates at branded ATMs. Industry experts estimate that branded ATMs perform 20% to 40% more transactions, depending on the location. With low costs, direct consumer reach, and improved transactional volume, ATM branding creates an opportunity for those who embrace ATM convenience. For More Information on ATM Branding or how your Financial Institution can get started with Branding, contact Best Products today at 877-663-6128.